Although chlorine free pools are difficult to achieve, ultraviolet light sanitation systems allow you to get close to a sanitizer free pool. What Is a Pool Sanitizer? Algae and bacteria naturally grow in pool water that is regularly used, and sanitizers are used to kill these bacterias. Sanitizers can include peroxide, bromine, javex, ozone, and most commonly, chlorine. Using sanitizers does create side-effects, so attempting to use as little sanitizer as possible is always the best route of action. One of the ways to use less pool sanitizers, like chlorine, is to subsidize it with an ultraviolet light (UV) sanitizer system. What Is an Ultraviolet Sanitizer System? UV sanitizer systems work to reduce the use of chemical cleaners, like chlorine, by up to 80%. 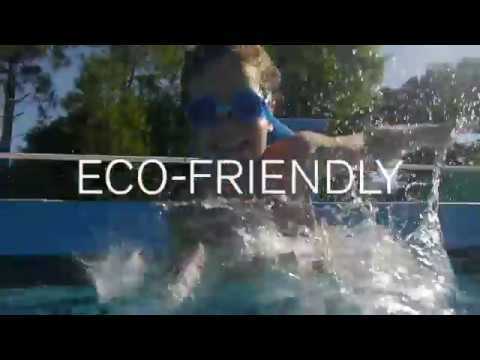 When harmful chloramines are eliminated, you, your family, and your friends will be able to swim underwater with your eyes open, while avoiding the red, burning eyes or itchy, dry skin that chemical exposure creates. By using an ultraviolet sanitation system, the levels of chlorine in your pool water will be similar to that of your municipal drinking water. That’s definitely an improvement worth mentioning! What Does a UV System Cost? Generally, the complete installation of a UV sanitation system costs around $1,300, including the plumbing upgrades. UV sanitation systems require little maintenance. However, there are two lamps located inside the UV unit which should be changed every 3 years, when used regularly outdoors in Winnipeg. These lamps cost around $300 for the set. Although the lamps will not necessarily burn out after 3 years, they do become less effective, and your pool’s demand for chlorine will increase substantially. How Do UV Sanitation Systems Work? For UV sanitation systems to be functional, they must work to kill bacteria within your pool water as they move past the ultraviolet light source. To reach the light source, water is pumped through an inlet filling at the bottom of the sanitation unit. After it has been fully sanitized, the water is pushed back through the outlet fitting, and back into your pool. The UV light has an intense germicidal ray, working to destroy any microorganisms present in your pool water. This concentrated electromagnetic ray also eradicates organic matter, completely eliminating excess chloramine formation. Although the exact chemistry is complex, we here at UV pools can tell you that UV sanitizers are impeccable at destroying unwanted particles within your pool water. These systems work so well, that they’ve been in use for more than 10 years to disinfect our public drinking water. How Effective is UV Sanitation? For more than 5 years, UV Pools have been installing these sanitation units, and our customers truly enjoy using lower levels of chlorine, while enjoying more clean and clear water than ever before. To treat any areas of your pool in which water doesn’t regularly reach the filter, a small amount of chlorine is recommended. Our team at UV Pools can analyze your pool for “dead zones”, and provide suggestions on how you can effectively manage and clean them. We all know that familiar smell of a public pool. As soon as you sense that strong stench of chlorine, your mind may wonder exactly how these intense chemicals are affecting your family’s health. 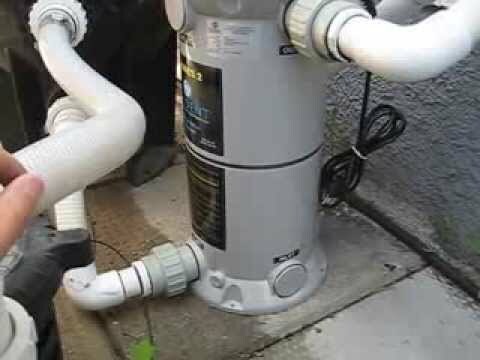 UV sanitation systems reduce your overall chlorine levels to that equal to municipal drinking water, eliminating the stink of chlorine, and minimizing your pool maintenance costs. These eco-friendly sanitation systems are easier on your pool’s plumbing, equipment, walls, and floor. Your pool liner will last longer, and look better than it would with the use of conventional chlorine sanitation, or saltwater pools. Enjoy the luxury of a pool that feels like a bath, without worrying about itchy, dry skin or crackly, damaged hair after a good swim. Your skin, hair, and overall well-being will thank you! As a pool owner, you realize the hassle of regular pool maintenance. UV sanitation systems decrease the amount of maintenance necessary for your pool, allowing pool ownership to become a more enjoyable task. The UV sanitizing lamp is the only piece of this equipment that involves regular maintenance, and these lamps can last for about 13,000 hours, or 3 years of swimming in Winnipeg. The lamp is easy to change, and can be completed within minutes. UV sanitation systems are pH neutral, meaning they do not affect the pH levels in your pool, like chemicals or saltwater do. Luckily, UV units are compatible with all pool pumps and filters. Our professionals at UV Pools can retrofit most installations to your existing pool equipment. The entire system takes up less than a square foot of space, allowing you to make the most of your backyard pool space. The only major space requirement of these units is an outdoor GFCI three-prong 120-volt electrical wall plug. Are you ready to save space, and efficiently sanitize your pool? Call UV Pools in Winnipeg today, and get a direct quote from our owner, Dale Kreviazuk. As water circulates through the ULTRA UV2 chamber the UV light immediately inactivates 99.9% of micro-organisms and algae which are resistant to chlorine. This provides a cleaner, clearer swimming environment with zero harmful by-products and reduces the amount of chlorine needed. Video explains how UV works. Here are a few benefits not listed. UV system burns off dead chlorine, maintaining your pool is easier, you save money on chlorine and you do not have to use corrosive salt in your pool. 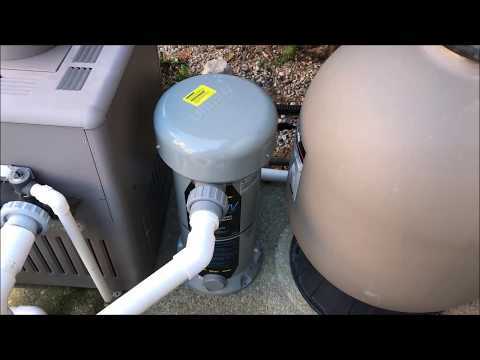 Video explains how to properly prepare your UV system for winter storage. Proper winterization is vital to ensure that the unit is not damaged during the winter months.